Here’s another interesting physical computing platform; the PIC-based Create USB Interface. The original design was made by Dan Overholt as a bridge between computer and world for musical and artistic applications. Seeed Studio has an updated design called the CUI32Stem, which has been tweaked to work well with the thirty-something sensors and actuators in their GROVE collection. The CUI32Stem can run Arduino code using the Chipkit “Multiplatform IDE” developed by Microchip. It also supports a free Real-Time Operating System called StickOS which allows you to program it in BASIC. 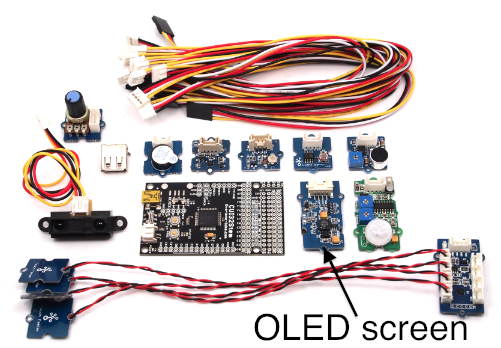 The CUI32Stem Grove Dash Kit is a starter pack, but many more sensors are available. The GROVE designs are all open hardware and are very well documented on the wiki with schematics, board files and firmware provided. Nice job!